Two years ago I was clueless about Gallet. So when I came across a 14k solid gold one up for auction locally, I passed on it. Or rather, I passed the info on to my buddy Justin Vrakas. (Hey, what are friends for, right?) Back then I don't remember Justin collecting Gallet. He was in the throes of growing his vintage watch retail business - watchsteez. I figured this little yellow gold complication would make for prime inventory - an affordable vintage chrono that would mesh nicely with the Bulovas, LeJours, Wakmanns and the like he was selling at the time. (All timepieces I thought were cool, but at the same time, not vintage Rolex or Heuer Carrera cool.) It would take time and tutelage from Justin for me to fully appreciate Gallet. The journey he's been on to amass his current collection of pride and joys has been a long road. He's gotten to where he is today by following his passion (being a champion for no-name vintage chronos), relying on his wristwatch acumen and by staying true to his sense of style. Before seeing the watch in the metal, Justin did a little research. He found Gallet World where he learned about the company's rich history of producing watches - more specifically producing chronographs. 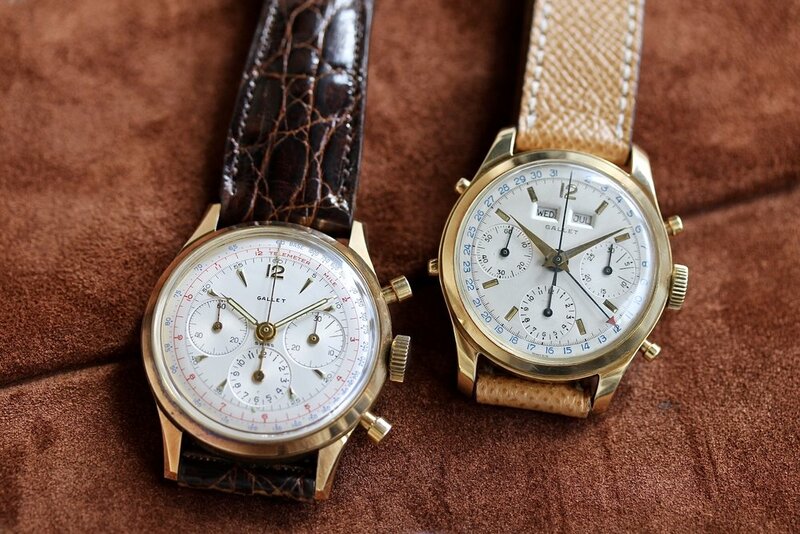 (I bet you didn't know Gallet made the first "waterproof" wrist chronograph.) It turned out Gallet made a lot of purpose-built timepieces. According to Gallet World, "Gallets were generally too expensive for the common man due to the costs of their superb workmanship and advanced timekeeping innovations. They were primarily for military, industrial and professional use." This explains why you'll find some highly-specialized applications incorporated into Gallet wristwatches, such as world time dials, artillery timing scales and pulsation tracks, just to name a few (on models dating all the way back to World War I). Justin proudly likes to point out, "Gallet was ahead of the pack in terms of chronograph innovations (no disrespect to the "big" brands)." About that steel Gallet he was offered - a MulitChron 45M Decimal - Justin told me he loved the notion that, "it was used in scientific, medical and lab studies for cutting a minute down - really quickly - into tenths or hundredths [using the red outer track]." Justin surmised this watch's function had to set it apart as a rare, unique piece. This, plus the fact the condition was super-crisp, or "insane" as Justin likes to say, helped him come around to the dealer's estimation of the watch. (Oh, and it came with its original wooden "coffin" box.) Now, almost five years later, with Gallet well-known to most in the watch community, the box alone goes for a pretty penny. Justin, being the connoisseur of chronos that he is, couldn't help but compare his new Gallet to other chronographs he'd handled. One thing that stood out was its build quality. Justin will debate you about Gallets with Excelsior Park movements. He has no qualms saying, "they're still the smoothest pushers I've ever felt. [And] I've run chronos on brand new Pateks..."
With regard to the movements, Justin says Gallet used both Excelsior Park (EP) 4 and 40 and Valjoux 72 (among others). But he wanted to clear up, "these movements were not used interchangeably." He stressed to me the movements are married to specific model/dial combinations. Gallet didn't drop movements into watches willy-nilly. So a true MulitChron 12-Hour "Jim Clark" only (and always) has been powered by an EP-40 movement. What's under the hood is one thing (Who doesn't want silky pushers? ), but it was also Gallet's pioneering legacy and aesthetics that won Justin's heart. Take for instance his Grail Gallet - his MultiChron 45M Yachting from the mid '50s. If you know Justin or follow him on Instagram @justinvrakas, you know he's obsessed with yachting and regatta watches. From Yema and LeJour to Ollech & Wajs, he's never met a colorful 3 o'clock sub-dial he didn't like. So when he learned that Gallet created the first yachting wristwatch he went on the hunt for one... It also didn't hurt that the design was killer. All these Gallets - Decimals, Yachtings, Flying Officers, you name it - have been out there, ripe for the picking, for years. But until Justin started posting his beauties on Instagram, most of us had no idea the brand existed. (Yes, I credit Justin with putting Gallet on our radar.) And even though we're well aware of the brand now, many of us still probably have no plans to pursue one, which Justin's fine with - that means more for him. But why is that? How come brands with lesser horological claims to fame get more love? I mean, if Universal Geneve chronographs can become a darling of the collecting community, why not MulitChrons? After all, Gallet does have some damn good looking watches with top-notch movements. Justin recalls hearing a story from the '90s about a dealer at a jewelry show who relegated Gallets to a grab box - not allowed to fraternize with the Rolexes, Omegas and Pateks in his rented display case. And not too long ago Justin had a firsthand experience that lent credence to that story: A big-time dealer steered him away from a Gallet, advising him, "you don't want that, it's junk." Justin is usually a cool, calm and collected character, but when the subject turns to Gallet I've witnessed the crazed collector in him come out. Justin summed up his feelings (and dropped some knowledge) by saying, "Gallets are true tool watches. Nearly every model was a chronograph designed with a specific purpose in mind. They didn't really make a no-date, time-only model - that simply wasn't the brand's DNA. Every watch they made was f@#king insane and gorgeous and amazing and I want them all. I can't say this about any other brand."